You'd better hope we didn't say everything we know about this guy last time, or this review is going to sound really familiar. The discovery of a top-secret jetpack hurls test pilot Cliff Secord into a daring adventure of mystery, suspense and intrigue. Cliff encounters an assortment of ruthless villains, led by a Hollywood screen star who's a secret Nazi spy. With the help of his actress girlfriend, the young pilot battles enormous odds to defeat his foes, who are anxious to use the device in an evil plan to rule the world. The dangerous mission transforms the ordinary young man into an extraordinary hero. That's the text from the back of the Blu-ray, because while the Rocketeer may have been born in the comics, Disney apparently bought all the merchandising rights when they licensed the character for their film. You want a Rocketeer T-shirt? Rocketeer lunchbox? Rocketeer anything-at-all other than a comicbook? Then it's got to go through the Mouse. Also, there's nothing on the back of the toy's box, so we had to find some biographical info somewhere. The likeness of Billy Campbell is very good. He's got a bit of a half-smile, and they did an especially good job on his nose. His hair flops to the side just the right way, too: when he was up for the role, Campbell went and bought the comic, then got his hair cut to look just like Cliff did in the art. Obviously it paid off for him. The only weird thing is the color of paint chosen for his skintone - it's so dark, he looks like he just got back from a week in the Bahamas. Though it appears to be an accessory from the way it's packaged in the tray, the iconic Rocketeer helmet is actually a second head - it isn't a hollow piece that fits over Cliff's head, you have to pop one off and replace it with the other. Unfortunately, that's where Funko's inexperience with full-fledged action figures gets in the way. The head mounts on a barbell joint. You know, two balljoints at either end of a stick? That. That would normally be fine, but you can probably predict what happens: when you try to pull the head off, the barbell pulls out of the neck instead, so you then have to grab some pliers and pry it out of the head, put it back in the neck, and then swap the heads. It would have been better if Funko had taken a cue from Marvel Legends and put a big balljoint on top of a hinge joint - it would swap more easily, and have a better range of motion. Yes, despite having two balljoints, the head barely tips back at all. You guys know he flies, right? And that flying involves looking forward, not just down? If anything, we should be complaining that the tailfin bumps against the jetpack too easily. But no. He can touch his chin to his chest, but he can't look in the direction he's flying. We'd recommend possibly cutting some plastic out of the back of the neck to increase the range, but then the wrong balljoint would pull out even easier than it already does. Other than that debacle, the figure has swivel/hinge shoulders, elbows, wrists, and ankles; balljointed torso and hips; swivel thighs; and double-hinged knees. Nice stuff, but every bit of it is made from clear plastic. Funko? Remember when you said you were done with that after Game of Thrones Series 1? Did you think we'd forget? We toy collectors are giant nerds, we remember everything. My figure is fine, but I know some people have had joints break right out of the box. Play careful. We've gotten this far into the review and have barely even mentioned the sculpt! It's good. Okay, maybe you'd like more information than that. The wrinkles on his clothes are simple and subtle, and the flap on the front of his jacket is a separate piece that's glued in place, creating the look of a multi-layered garment. 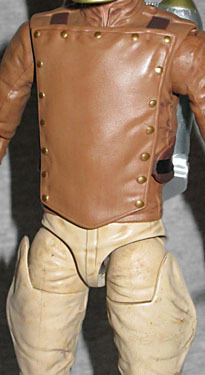 The first promotional renders of the toy suggested that would be a removable piece - the mock-up of the figure treated it as though it would be packaged separately. It's not, it's glued securely, so don't expect to pry it off. 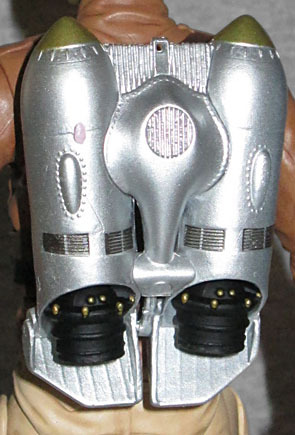 The waist joint is hidden by the strap of his rocket pack, and the twin triggers are sculpted on his gloves. He's wearing jodhpurs, and the starchy poofs on the thighs rise over the joints without getting in the way, like Lion-O's thigh muscles. 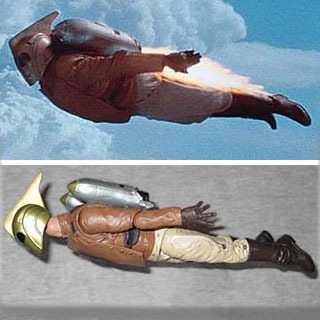 One sign that this toy is based on the movie, rather than the comics, is the jetpack: the way Dave Stevens drew it, it was a single-engine device that really did look like a short, squat rocket; it was Disney that turned it into the much more familiar (and, let's be honest, a lot cooler) dual-engine jet. Fun fact, though? While the comic never comes right out and says it, the Cirrus X3 pack was built by (famous pulp hero) Doc Savage. It's interesting to compare this sculpt to the one on the 4" figure - all the same details are there, but they've been done differently. Also, it's made from multiple pieces that had to be assembled, rather than one big chunk. Sadly, the pack is not removable. 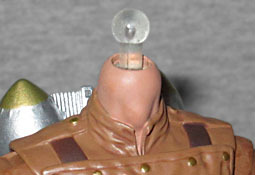 Rocketeer's only accessory (since the "helmet" is actually a complete head) is his Luger Mauser. He'll be forever holding it in his hand, though, because Stevens designed him without a holster, and the movie followed suit. The ReAction figure was fine, for people who like the shallow end of the pool, but it's absolutely amazing to have a real action figure of the Rocketeer. He's got some flaws, but we'll have to overlook them - after all, it's not like there are a lot of options out there, and we'll take an imperfect figure over "no figure" any day. 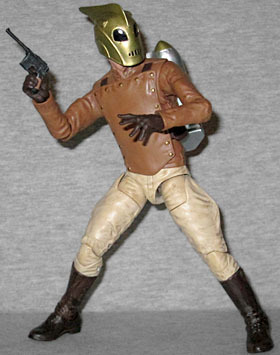 Fans have been begging for a Rocketeer action figure since 1991, so right now we're not going to get too choosy.